Today’s announcement is part of the Commission’s broader reform of EU copyright laws and the first legislative proposal to stem from the executive’s 16-point digital single market plans presented this May. The current EU copyright law dates back to a 2001 directive. Under the proposed new rules, Europeans would be able to use content they’ve paid for when they’re temporarily visiting other EU countries. The law wouldn’t give expats a free pass to access subscriptions to services like Netflix for a longer period of time if they were bought in a different member state. The Commission did not specify a time limit for how long Europeans could stay in another country and still be able to access online content as temporary visitors. Companies that sell digital content or subscriptions would be able to verify where consumers’ main residence is. Commission sources said only one country would be considered a valid place of residence. Much of the copyright plans floated by Commission officials over the past few months was put off until spring 2016, when the executive will propose more legislation on access to television and radio online and on how news aggregating services can use copyrighted material. Digital Commissioner Günther Oettinger has spoken favourably of ancillary copyright laws that require services like Google News to pay news publishers if they link to or reproduce short snippets from copyrighted articles. Commission sources confirmed they would look at the controversial Spanish and German ancillary copyright laws before proposing legislation next year. Under the executive’s proposed rules, the regulation on content portability across EU borders will go into effect six months after it is approved by the European Parliament and Council. Some representatives from the entertainment industry balked at the six-month implementation phase, and argued they’d need more time to review existing contracts. The European Commission proposal would apply to already existing contracts held by copyright holders such as film and television production companies. Some audiovisual companies are already adjusting their contracts. The UK Premier League’s contracts for football broadcasts will include a clause on portability starting in the next football season, before the EU regulation is implemented. Mathieu Moreuil, head of European public policy for the Premier League, said the Commission should clearly define how long a person can stay abroad and access content from their home country. But he added that the Commission’s proposal expected next year on cross-border access to broadcast material online is more concerning. “The portability regulation is fine. But the European Commission should be aware that if they go beyond that we’d be very opposed,” Moreuil said. Oettinger defended the executive’s proposal, in order to allow access to digital content only for short-term travellers within Europe and not for longer stays abroad. “If you took no account of someone’s normal residence, then I could find examples in member states where pay-per-view or pay TV is cheapest for films and for sports. So I could acquire transmission rights in Malta for English football and that’s something that not all the stakeholders would be happy with,” Oettinger said. Filmmakers and film industry associations have aggressively lobbied the Commission not to touch geoblocking, or the technical of access to material based on where someone is. Yvon Thiec of Eurocinema, an association representing the French film industry, also criticised the Commission for not defining how long someone can temporarily be abroad and access content they paid for at home. “We need to avoid that people staying somewhere longterm can be beneficiaries,” Thiec said. “It’s too easy for people to misuse. It would destroy the principle of territoriality,” he added. Other lobbyists called the Commission’s proposal toothless, and argued it wouldn’t do enough to lift restrictions hampering consumers’ ability to choose between services. “Unfortunately, the new rules will not solve the problem that many Europeans are currently still unable to buy film or video subscriptions from another Member State,” said Monique Goyens, director general of the European Consumer Organisation (BEUC), adding that the Commission should end geoblocking. Since offers differ between services that may be available in multiple EU member states, consumers would not be able to use the Belgian version of Netflix if they are living in Italy. Some lobbyists argued that could cause users to turn to pirated material when they can’t find what they’re looking for through legal services. “If they want content on Belgian Netflix, they can either find some of it on the pirated market, or use a virtual privacy network (VPN) and pretend to be in Belgium,” said Innocenzo Genna, chair of the innovation and grow committee dealing with copyright at Euroispa, the association representing European internet service providers. “We’re talking about people who are willing to pay, not people who want to use pirated material,” Genna added. The European Commission plans to make another announcement in spring 2016 about piracy. Officials said the executive wants an EU-wide voluntary ‘follow the money’ approach to tackle illegal content. German MEP Julia Reda (Pirate Party), rapporteur on the Parliament's copyright report: "The proposed new rules on the portability of digital content only address a narrow spectrum of the problems faced by users. The proposals will clearly benefit those who have subscriptions to providers like Sky or Netflix and want to use them while abroad. However, geoblocking is a problem that most adversely affects those who need access to services not offered in their countries of residence, such as linguistic minorities or immigrants. Today's proposals would continue their inability to access culture and knowledge in their own language or from their countries of origin. We will look to rectify this in the legislative process. Overall, the copyright reform proposals are a far cry from commitment by Commission president Juncker to 'break down national silos' in copyright and ignore many demands made by the EU Parliament." Helen Smith, executive chair of Independent Music Companies Association IMPALA: "It is essential for the EU to catch up with the market. An ambitious 'follow-the-money' approach is needed to complement music companies in their bid to boost Europe's digital music market through licensing. Reinforcing copyright is an important part of the equation. Developing an industrial policy for culture to grow Europe’s digital economy is where it gets really interesting. Measures to promote investment and diversity, as well as a new regulatory framework for smaller actors, are all key priorities." Jakob Kucharczyk, director of European operations for the Computer & Communications Industry Association: "It is not clear why the Commission embraces the idea of a link and snippet tax. The ancillary copyright failed in Germany and in Spain, it is opposed by publishers themselves and the European Parliament rejected it. It has driven smaller publishers and news aggregators out of the market. It stands in the way of a functioning digital single market and hence in direct opposition to the Commission’s own policy goals. We urge the Commission to base future intervention on evidence and facts, instead of vested interests from a maximum of two Member States." John Higgins, director general of trade association DIGITALEUROPE: "We are delighted that the Commission has finally acknowledged what a mess the levies system is. We have been raising these issues with lawmakers for over ten years by now and urging them to reform the system in light of the digital technologies most of us now use every day of our lives. [...] The Commission must find a way to balance the interests of rights holders, while also allowing society to take the maximum advantage of the free circulation of knowledge and creative works." Dutch MEP Marietje Schaake (ALDE): "With these proposals the Commission is taking an urgently needed step towards a digital single market. It is rather outdated that you cannot enjoy the music or films you buy, directly or through paying taxes, when crossing an EU border. [...] If I want to watch a program of the Dutch public broadcaster in Belgium, it is restricted by geo-blocking online while it is accessible on Belgian TV. Unfortunately the portability proposals do not end geo-blocking and only allow EU-wide access to content available in the country of residence or where the user has an internet subscription." League of European Research Universities (LERU): "LERU urges the Commission to proceed as speedily as possible with a mandatory Exception for Content Mining, which cannot be overridden by contract or Technical Protection Measures. Legislation to that effect should appear in the early Spring. And the scope of the Exception should be widened to give legal certainty to all those with legal access to content to undertake Content Mining activity." President Juncker's strategy for a single European market is as follows: to build confidence between stakeholders, to bulldoze obstacles, to guarantee connectivity and access to digital technology across the EU, to build a digital economy, to promote e-society and invest in research in technology and information. 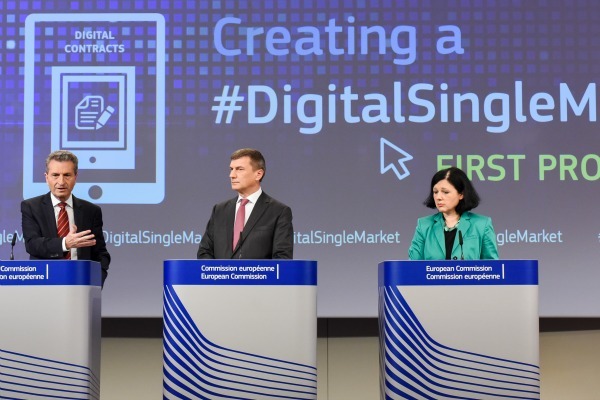 Andrus Ansip, the Vice-President of the Digital Single Market, is leading this initiative. The European Commission presented its 16-point digital single market strategy in May 2015. The Commission will propose more copyright legislation in Spring 2016.